After an exceedingly depressing offseason, in which months passed without anything happening and top free agents remain unsigned and two-thirds of the league evinced no interest in winning, it is time to feel good. Feel good about the weather warming, feel good that it’s just one day until real, actual baseball. And feel good that at least one team out there is making the effort to be as good as it can be. The feel-good team of the spring is, unexpectedly, the Padres. They signed the best free agent on the market (an evaluation supported by the baseball people who ended up signing the other best free agent), and as camp breaks, they are young and getting younger by the roster move. Will they be good? Eventually, probably. More important is that they’re trying. Most important is that they’re going to be fun. 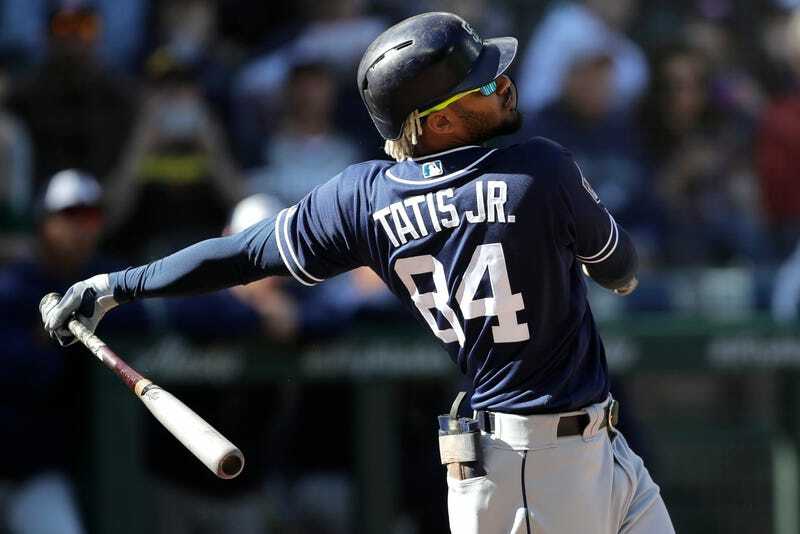 In a 24-hour period, the Padres announced that their top hitting and pitching prospects, Fernando Tatis Jr. and Chris Paddack, will start the season in the majors. Both will skip AAA altogether. They are that promising, but this isn’t even just about promise. As manager Andy Green observed, this is about making the team better. In a cynical era of service-time manipulation, that’s a truly refreshing sentiment. Tatis was the No. 1 prospect in all of baseball per ESPN’s rankings and No. 2 in Baseball America’s and MLB.com’s, and he’s going to be San Diego’s opening day shortstop at age 20. Taller and stronger than his former MLBer dad, he’s expected to hit for both power and average. In fact, there’s not really a lot anyone thinks he can’t do. He’s fast—the game that may have made up the Padres minds came on Friday, when Tatis reached on two infield singles, stole two bases, and scored from first on a routine single. Even his glove is getting better, and should continue to improve. He is the prototypical five-tool prospect, and now he’s no longer a prospect. Then there’s Paddack, whose journey to the majors was not nearly so smooth. An eight-round pick in 2015, Paddack threw just 42 innings in 2016 before tearing his UCL and undergoing Tommy John surgery. He wouldn’t even step back onto a mound until 2018, but when he did, he was lights-out, tearing up high-A and then AA ball. A tall righty with a killer fastball-change combo, Paddack maxes out at about 92-96 mph, so he’s not a fireballer, not just yet, but he’s got pinpoint control and his change-up has the sort of movement that’s already made major-league hitters look silly. Despite Paddack making just eight starts in double-A, the Padres saw enough to believe that he’s ready. How they broke the news to him is its own feel-good story. On Monday, Green came out to remove Paddack from the game after just 49 pitches. He was surprised that he was coming out so early. The entire infield had gathered at the mound, and Green turned to first baseman Eric Hosmer and asked him, “where are you going to be Sunday?” “Right behind this guy,” Hosmer said, gesturing to Paddack. Us too, the other infielders said. That’s right around when Paddack figured it out. Tatis and Paddack will join other talented young Padres, including outfielder Franmil Reyes, who tore it up at the plate after a midseason call-up last year, and, eventually, middle infielder Luis Urias and lefty MacKenzie Gore, a third overall draft pick—now the team’s top hitting and pitching prospects—both of whom will start the year in the minors. Oh, and some guy named Manny Machado. The Padres may not have arrived just yet, but they’re coming.